Effectively vaccinating your horse is the best way to keep him from developing a serious or fatal illness such as strangles or tetanus. Knowing the value of vaccines as well as when to vaccinate your horse will help you minimize the risk of infection and maximize his chances of survival if he does contract one of these diseases. Tetanus is not a contagious disease. Tetanus occurs when your horse receives a wound that becomes infected with Clostridium tetani organisms. Clostridium tetani are present in the intestines and feces of horses and other animals. When these organisms enter an open wound or come into contact with exposed tissue of an unvaccinated horse, tetanus may develop . Symptoms of tetanus in horses include stiffness, poor muscle control, muscle spasms and difficulty or inability to eat or swallow. Tetanus, often fatal, rarely occurs in the United States due to high levels of vaccination in the equine population. The American Association of Equine Practitioners considers the tetanus vaccine to be a standard vaccination for all horses regardless of region. Foals as young as 4 months old can be vaccinated against tetanus; adult horses should be vaccinated once a year to prevent infection. Up-to-date vaccinations offer almost complete protection for your horse against tetanus; previously vaccinated horses that develop the condition are generally more likely to recover than those having never received the vaccine. Strangles is an extremely contagious disease caused by Streptococcus equi bacteria. 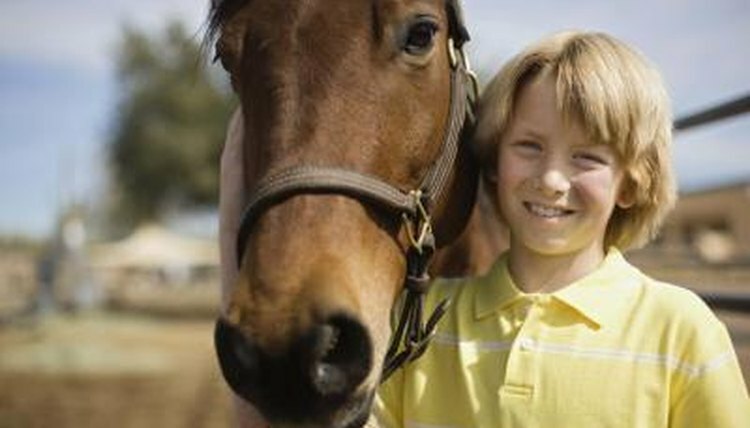 Strangles is most likely to occur in unvaccinated horses less than 5 years old. Your horse can catch strangles by coming into contact with a recently infected horse or with an area where a horse that carries Streptococcus equi has recently been. Horses exposed to strangles typically come down with symptoms within three to 14 days of being exposed to the bacteria. Horses with strangles will have a fever, loss of appetite and severe inflammation of the lymph nodes. The strangles vaccine is not part of the core group of standard vaccinations recommended by the AAEP for horses across the United States. The strangles vaccine is typically only administered in areas where strangles outbreaks are known to occur or are occurring. It is also given to horses considered to be at high risk for coming into contact with Streptococcus equi -- typically show horses, horses living in high-traffic stables or those sent off for breeding. Both live and killed strangles vaccines exist; your veterinarian will be able to help you decide which is the right choice for your horse based on other health considerations. The strangles vaccine can have potentially dangerous health side effects. Once the initial dose and subsequent boosters have been administered to high-risk animals, re-vaccination is recommended every six months to a year.